Now in Paperback for only £10 on Amazon. Every day we are bombarded with political rhetoric in the form of interviews, debates and statements from our political leaders and commentators, on the television, radio and internet. Underlying this rhetoric is the micro-world of spoken discourse that we rarely get to see or explore. This micro-world consists of politicians and commentators hesitating, equivocating, pausing, and using all their rhetorical nounce to get their message across while presenting themselves in the best light and avoiding saying anything that might damage their face. This book takes an in-depth look at this micro-world. It explores the spaces between utterances and words, and the gaps between turns and transitions. 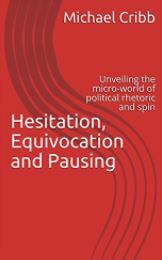 For each discourse event analysed from the recent British political calendar, the reader is presented with a detailed transcript of the discourse using an approach to studying dialogue known as Conversation Analysis. External links to recordings of the events also help the reader to listen simultaneously to the original discourse while the micro-world of political rhetoric and spin is unveiled.